Skyrocketing data volumes make long-term digital asset management a major challenge, and increasing data retention requirements only exacerbate this challenge. Unfortunately, storage area networks and network-attached storage can no longer scale cost-effectively to accommodate large amounts of data. This resource highlights a secure, cloud-based archive solution that can protect and preserve data and enable access to data whenever you need it. 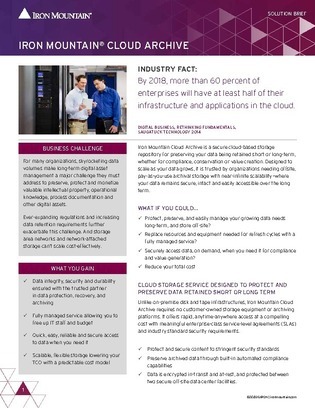 Read now to see how you can ensure your data is secure, durable, and easily manageable with a scalable, flexible cloud archive system.